Clothing retailers have dramatically changed the shopping experience for consumers. What were once all shopping malls and department stores have evolved with the Age of Technology, with a large part of the fashion industry moving into an e-commerce market.. The majority of shopping can now be done online, and some companies, like J. Crew, even offer chat-room stylists. 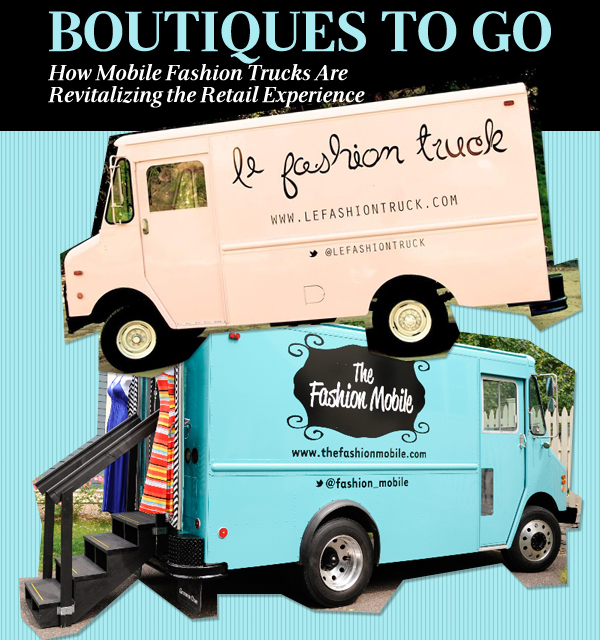 However, in the last couple of years, mobile fashion trucks have bolstered up on the east and west coasts. In the same way an ice cream man would come to neighborhood kids, fashion mobiles come to the fashionistas. And like any other store, these boutiques-on-wheels provide fashion forward pieces, everyday staples, accessories, and home goodies—on the go. With so much competition to break into fashion, these chic trucks offer both the seller and consumer a different fashion experience. The seemingly successful endeavor has spread out from the coasts and into Middle America. Husband and wife duo, David and Theresa Grim of “The Fashion Mobile,” are based in Stillwater, Minnesota. Before venturing into this mobile venture, they had owned what they called a “traditional brick and mortar” shop: Doozie Chic Boutique. Unfortunately, after two years the couple—like many shop owners—had to close down. These fashion mobile stores can be found on street sides, community events, office buildings, music festivals and private parties. There’s no wonder why consumers get pleasure from these boutiques on wheels—the owners know exactly who they are and what they want. It causes an intimate relationship to develop. David explains that that they’re not only taking the time to find their customers, but they also get to know them by answering their questions—all of which shows the customer that David and his wife want their shoppers to find what they want, and be happy with it. This is how mobile shopping takes advantage of the novelty status. Novelty and creating a positive customer experience can be the determining factor in having a long career that is sure to compete with e-commerce. One of these novelties is that mobile fashion shops can be booked for parties or events. Stacey and Jeanine, co-owners of Le Fashion Truck. Photo: Alan Mura. Stacey Steffe, one of the co-founders of Le Fashion Truck in Los Angeles, California, says that her customers appreciate the one-on-one shopping at a private event. And a styling experience it is, as the store owners put a lot of time into curating the pieces that they sell. The clothing, shoes and accessories that are chosen are hard to find pieces picked specifically with the shop’s demographic in mind. These pieces can be vintage items sought out at trade shows, to modern high fashion pieces from department stores. No matter where it’s bought, a lot of consideration is taken before purchasing. The customer is always kept in mind even when it comes to buying from local designers. Steffe explained that when choosing a local designer, she makes sure they fit the bill for the Le Fashion Truck demographics. Like any other store, fashion mobiles do exactly what retailers do: they are up to date with trends, they take extreme pride in their purchases, and they certainly value their customers. These mobile fashion trucks appear to do more than provide great buying stories, it adds another layer of retailing that can be explored by young fashion hopefuls who want to break into the scene. In an interview with US Today, Dave Lavinsky founder of Growthink, explains that trucks are not only cheaper, but with the help of social media and the easiness of going to your consumers, one can expect growth. In other words fashion mobiles are the future of small business. With no rent payments for space, which can often be the biggest expense for retailers, a mobile fashion business offers a low starting cost allowing owners to see profit quickly, which can then lead to expansion, or a long time career — a comforting thought to keep in this cut throat world of fashion.